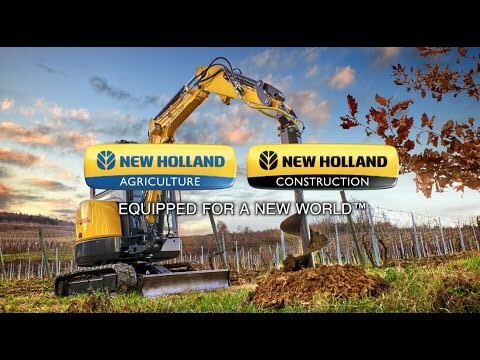 New Holland was birthed out of the entrepreneurial spirit — the spirit of innovation and leadership that generates new ideas, new products and new business processes. This month, we look back at the decade spanning 1936 to 1945. In this decade, Ford introduced the 3-point hitch on the 'N' tractor series, one of the most successful tractor families ever, and New Holland began what has become a legacy in hay tools with the introduction the self-tying baler. Developed by inventor Edwin B. Nolt, Nolt sold the rights to his self-tying baler to the New Holland Machine Company in 1940. New Holland was still struggling in the wake of the Great Depression, but with Nolt joining the company, the mass-produced hay baler helped turn the ailing company around. As the self-tying baler gained traction on American farms, Europe saw the introduction of the Fiat crawler tractor equipped with the Boghetto Otto-cycle low compression engine — an engine that could run using different fuels such as petroleum, diesel, alcohol, gasoline and methane. It was produced and sold until 1947. *Interview with Noah Kreider, Jr., May 18, 2015. No one bales more hay every day than New Holland. New Holland continues to be a leader in hay tools with the best balers in the market. The harvest window can be short, so machines have to have capacity and be reliable. New Holland’s Roll-BeltTM Round Baler provides a 20% increase in intake capacity due to its active sweep pick-up design. According to a study by Penn State, bales that were cut using New Holland’s industry-exclusive Bale Slice system saw an average of 14% increase in density when compared to unsliced bales. Additionally, feeding bales sliced with this method can lead to an increase in average daily weight gain in yearling heifers by 23%. As New Holland continues to be the industry-leader in hay tools, we have decided to share the Gold Standard of balers, the Roll-Belt 450 Silage Special Round Baler, through our 1st Cut Competition. Visit www.NHFirstCut.com and upload a picture of your first cut to be entered to win one year's use of the Roll-Belt 450! Hurry, the contest entry period ends July 31! So how do we celebrate a 75-year legacy of knotting started by Ed Nolt? We continue to innovate to provide solutions for the next generation of hay producers. From a technology standpoint, we are working to reduce the number of required monitors on our tractors. Soon, our baler monitor will be incorporated into the tractor’s monitor and will be ISOBUS compatible. Our haybines, which revolutionized the hay making process by combining the cutting and conditioning processes in 1964, continue to provide efficiencies for today’s farmers. Our Discbine models 313 and 316 offer an increased width of 22% in the conditioning system, providing the best cut-to-condition ratio. Our windrowers offer auto-guidance, which helps reduce operator fatigue and improves field efficiency. These are just a few innovations that ensure our farmers continue to be New Holland SMART.